Osceola, oil painting by George Catlin, 1838. Catlin is one of the three artists known to have depicted Osceola from life. Smithsonian American Art Museum. Osceola would become the most famous Seminole chief of the war, yet by birthright he was neither a Seminole nor a chief. Born around 1804 in Alabama, he was the son of an Englishman named William Powell who married among the Upper Creeks. 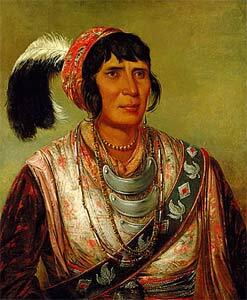 Osceola emigrated to Florida as a boy and as a result lacked any hereditary claim to Seminole leadership. Moreover, he was an ethnic polyglot, the product of a culture where Creeks, English, Scotch-Irish, and blacks mixed and intermarried. In the words of one of his most dependable modern biographers, "Osceola was all of these."